I looked down at Jani’s purple laceup sneakers, painted to look like fish scales. Her short bleached blonde hair and backward baseball cap. One thing was obvious, this was a woman with a strong sense of aesthetics. The stuff out of nothing that Jani refers to includes wild jewelry made from found objects, metal, feathers, coloured with bright nail polish, spikes, chains and all. A shoulder strap accessory that wouldn’t look out of place in the depths of club kid culture. She also has furniture decked out in toy dinosaurs wearing a single high heel as a crowns and big eye- lashes. “Here’s one that I gave to Lori last year. I think it’s too advanced for The Stand.” It was a pink tyrannosaurus rex turned into a lapel pin. Its head bent slightly, ever so snug across the collarbone. It is so sweet, in a macabre sort of way. Jani was quick to inform us that she had little inspiration for the arts as she was growing up. She was a genuine mountain girl from Bavaria, adopted by hippy German parents. “They found me in the fields in Mongolia” she said with a shrug. It was a refreshing change when Jani finally met Lori because she immediately felt Lori understood what she was doing. When asked what type of artists Lori promotes, Jani, was quick to quip “the lost and weird ones”. Lori guides, shapes, encourages and is both direct and never-endingly patient. She helps bridge the gap between what the world wants and what Jani has to offer. On a practical level they also quickly bonded over their mutual love of making things out of trash. 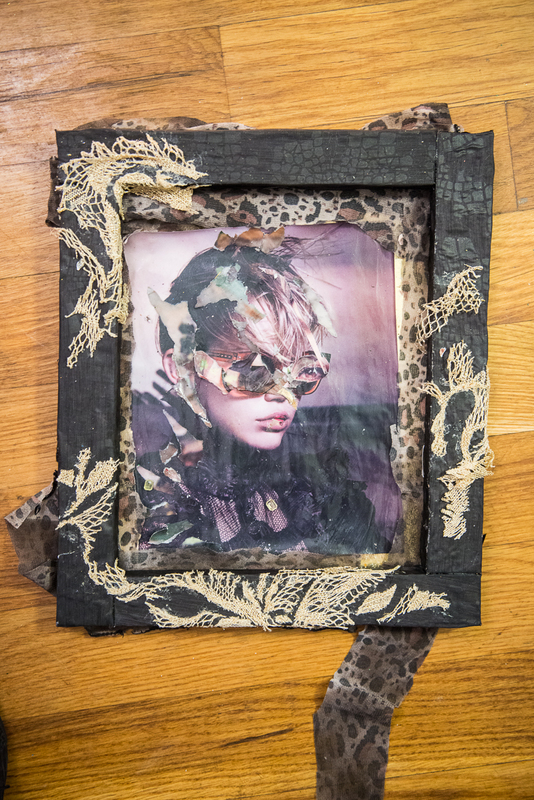 Where Lori started making artistic creations from junk found in Paris, Jani found the streets of New York to be a continuous source of inspiration. Like many artists at the Stand, Jani feels compelled to make these pieces. “For me it's like meditation”. Her motivation to make objects was came from a deep psychological urge, rather than meeting a commercial need.